With hundreds of anglers fishing Chesil and conditions being almost perfect you would think that we would have seen loads of Cod caught. Unfortunately that was not the case. A few Cod were caught on Friday and Saturday night, but for most anglers it was the usual Pout, Dogfish and Whiting. There was no lack of fish, but for those that had traveled a long way then it must have been disappointing to not find the Cod that everyone thought would be there. 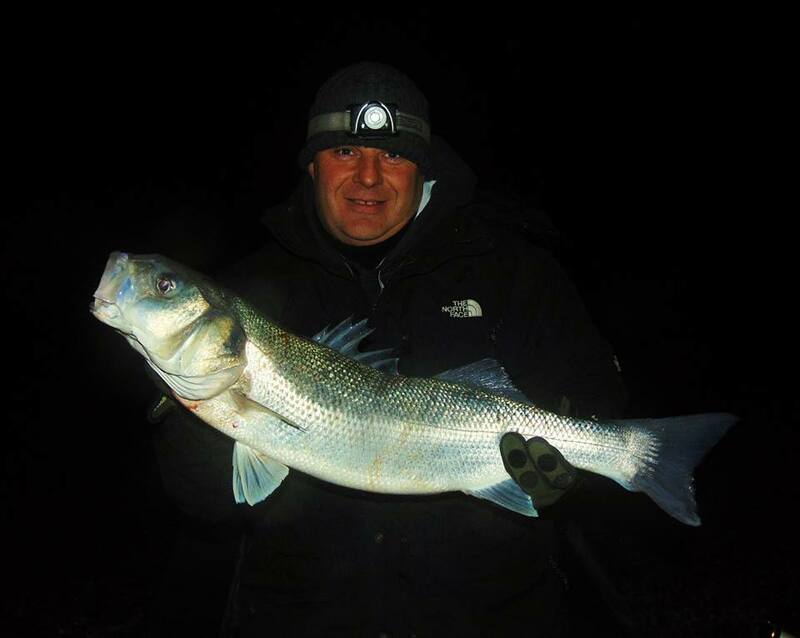 However some were certainly not left disappointed; Rick Garford had this lovely 9lb 2oz Bass from the Ferrybridge area. A large number of anglers fished the Weymouth Angling Society monthly shore yesterday, where there was no Cod caught either. Andy Ellard, whom I had spoken to in the tackle shop earlier won the largest fish with a cracking 2lb 2oz Sole. As the winter progresses and the Cod fishing seems to be getting worse, my thoughts start to turn to Pike fishing. I had a few sessions last year, but I intend to do a lot more this winter. Especially when I am encouraged by Dan Hollins monster 23lb 4oz Pike from the Hampshire Avon. 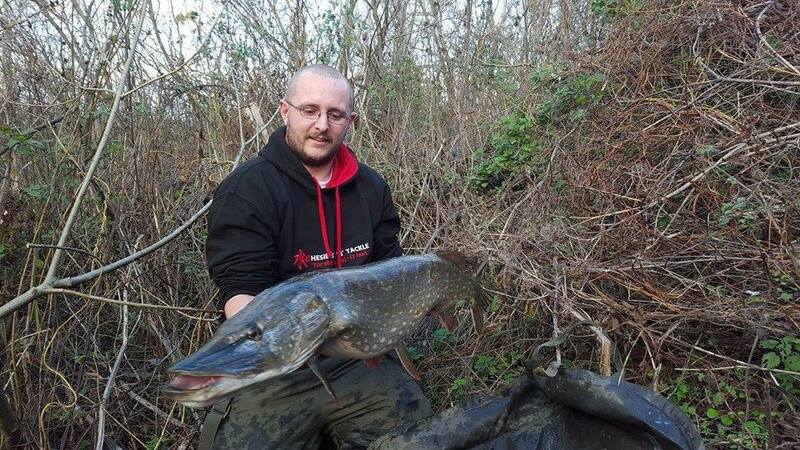 Dan caught the Pike on a Savage Gear hard eel lure. I will be out on the rivers myself over the net few weeks, but I have a treat for you very soon, in the form of a great article on fly fishing for Pike from a Kayak. It is being written for us by BBC’s Earths Wildest Waters, semi finalist Jo Stephenson. Tomorrow we will also have the latest from Leo Toms, on what is happening around Poole. Portland: Large Calm with almost clear water. Chesil Beach forecast: Well the Cod may not be around but there are still plenty of other species to be caught. There are plenty of Plaice still around at Cogden and West Bexington, as well as Garfish during the day. Some nice Whiting can be caught during darkness and we are still in one of the best months for Bass. Portland: Despite a couple of cold days recently, water temperatures are still above average. The Wrasse are still feeding well and the Bass should be close inshore . If the water clears the Pollock will move in again. Portland Harbour: This is one of the last weeks that we can expect good numbers of Bass. As usual I target them on lures. Flounder are always on the cards from any of the sandy marks in the harbour. Ferrybridge has produced plenty of Wrasse and small Pollock recently, as well as the odd Bass on bait. Weymouth Bay: The inner harbour is pretty coloured, with the water coming down from Radipole lake. The harbour is starting to fill up with Flounder and there is a chance of some Squid from either pier. More Flounder and Dabs are being reported from Preston and plenty of Whiting and Pout at night. 7 Responses to "A very disappointing weekend for most"
Hi Sean, not an excuse, but do you think the fleet of trawlers, dragging the length of Chesil on Friday made a difference? What is the legal distance they can come in? Fishing must of been good for them as they passed 3 times whilst I was there 1030-1530, coming in about 300-400yds. There is no limit as to how close the boats can come to the shore. However those two boats are Scallop dredgers, so will have no effect on the Cod. I managed a Cod on Sunday evening to the extreme right at Abbotsbury – never seen it so busy! A nice plump fish of 5lb 5oz on black lug/mackerel cocktail! I read with interest that you say Weymouth Harbour is starting to fill up with flounder. I fancy having a go at these. Should I be fishing from either of the piers, or further up the harbour? They move right up into the harbour as far as the sluice gates. My advice would be to find the most comfertable spot out of the wind and fish there. Well done on the Smoothound. We do get them in December and even in January sometimes, but they are not common at this time of year. The numbers of Cod are well down from last year, but that is to be expected, especially when you consider the thousands that have been landed by anglers since last october. What is worrying is the lack of another younger year class. I fear Chesil will soon return to it’s normal level of Cod fishing.